Christmas is just days away. 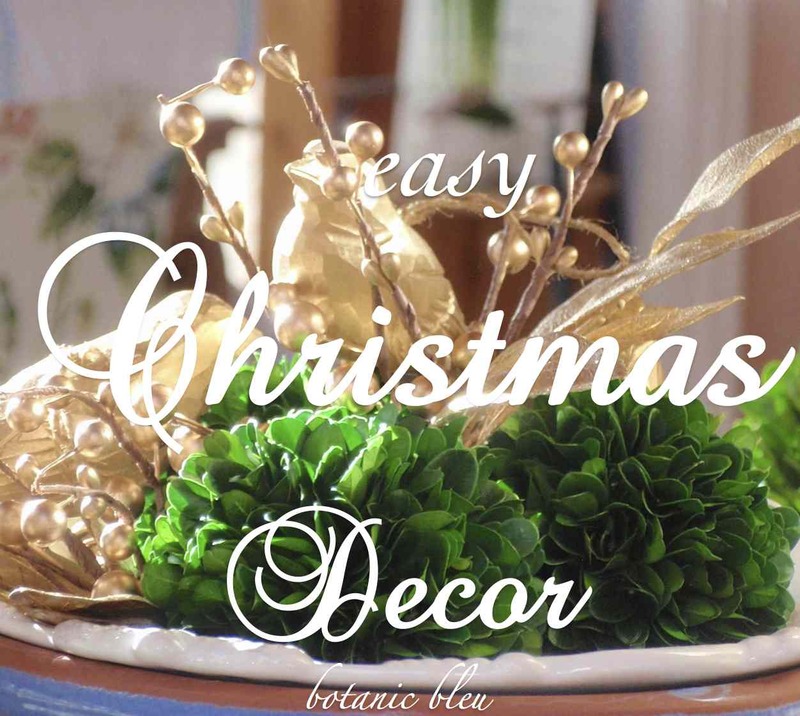 Less than a week away, there is still time to do some easy Christmas decorating. With just a few changes, including using some of your existing decor, you can quickly take a room from its ordinary everyday look to a room that celebrates the season. The easiest way to add a little Christmas to the house is to add a plant, fresh flowers, or even a dried botanical. Botanicals do not have to be the usual traditional Christmas flowers of poinsettias, paperwhites, or amaryllises. The plants and flowers shown can be found at a grocery store, and the two round botanicals can be found at a craft store. Choosing a special container adds a seasonal touch. Compare how the lemon cypress tree in the small black plastic pot looks with how the same size lemon cypress looks in the French design gray vase with its floral garland. 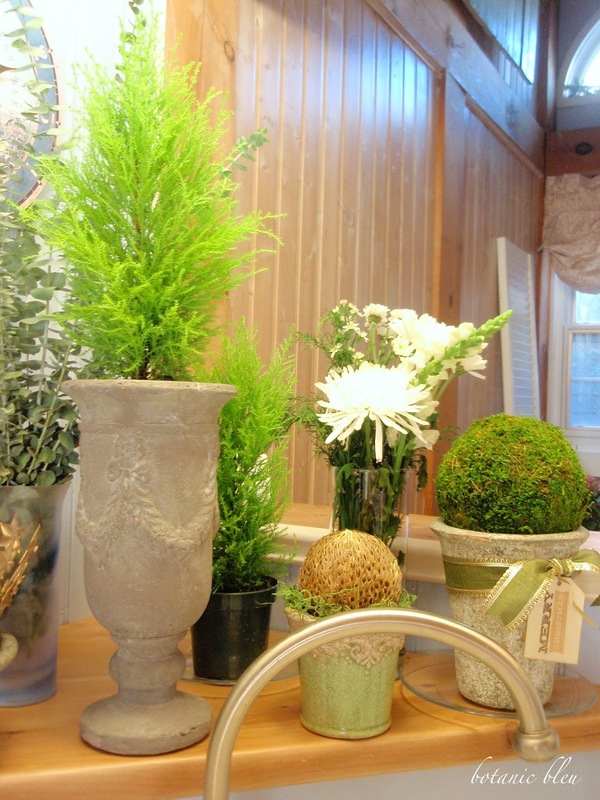 The floral swag on the vase is a traditional Christmas look and dresses up the lemon cypress tree. 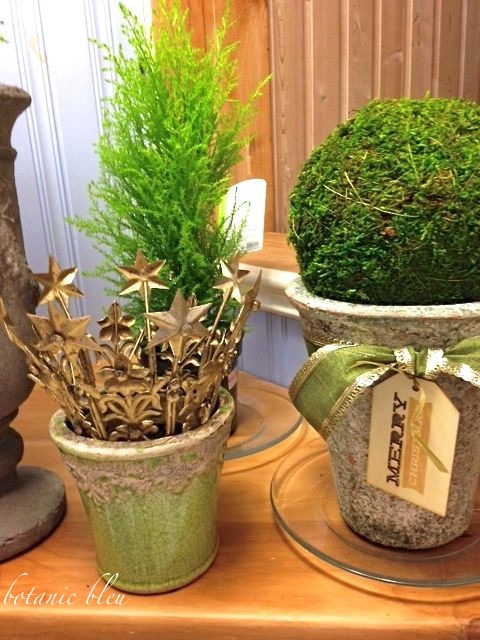 The little green ceramic pot holds a gold painted botanical wooden ball nestled in a bed of moss. Fill the bottom of the pot with shredded paper so that only a little moss is needed at the top of the pot to hold the round wooden ball. 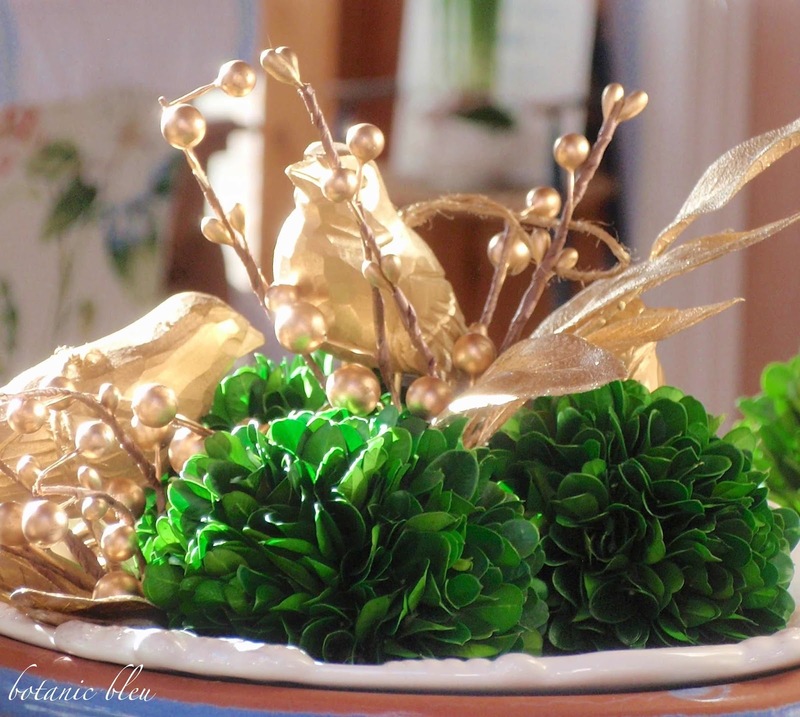 Adding a little bit of gold, such as the small crown, also dresses up a little green ceramic pot and gives an unexpected special look to a group of plants and botanicals. 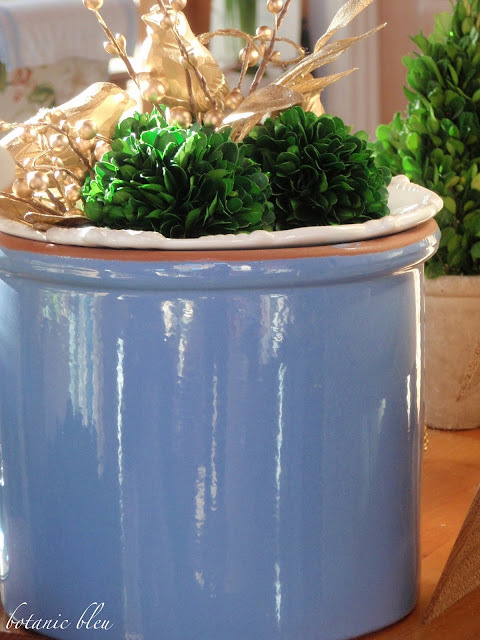 A gold filigree-edged wired ribbon takes a small rustic pot from an everyday look to a holiday look. 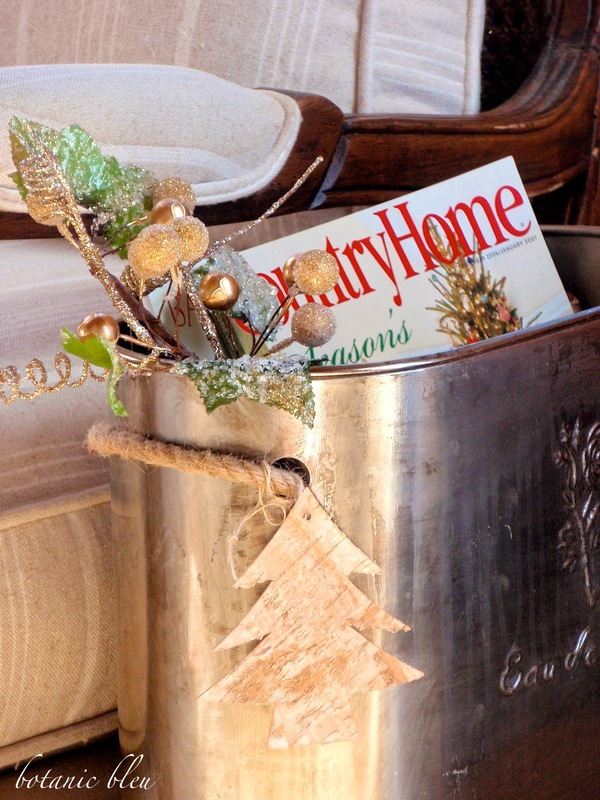 Adding a wooden tag with a Christmas greeting adds even more holiday cheer to an existing potted plant/botanical. 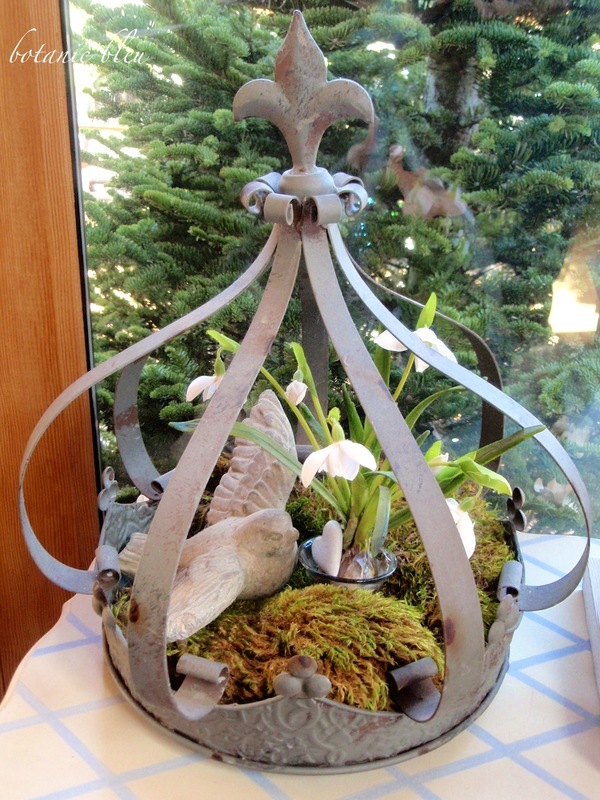 You may not have a crown like this one, but you probably have an unusual bowl, basket, tray, or box that you can fill with moss and create a similar look that fits your decorating style. Since I love French Country, I use pieces with a French look like the fleur de lis that tops the gray metal crown. If you love American Country, you could use a vintage or rustic box as your container. 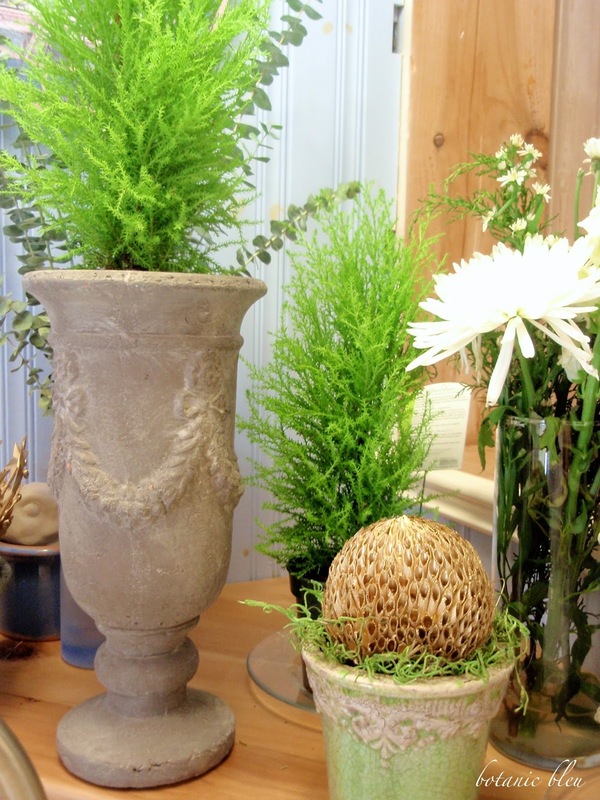 Fill the bottom of the container with "mood moss", a type of moss that is mounded, not flat sheets. 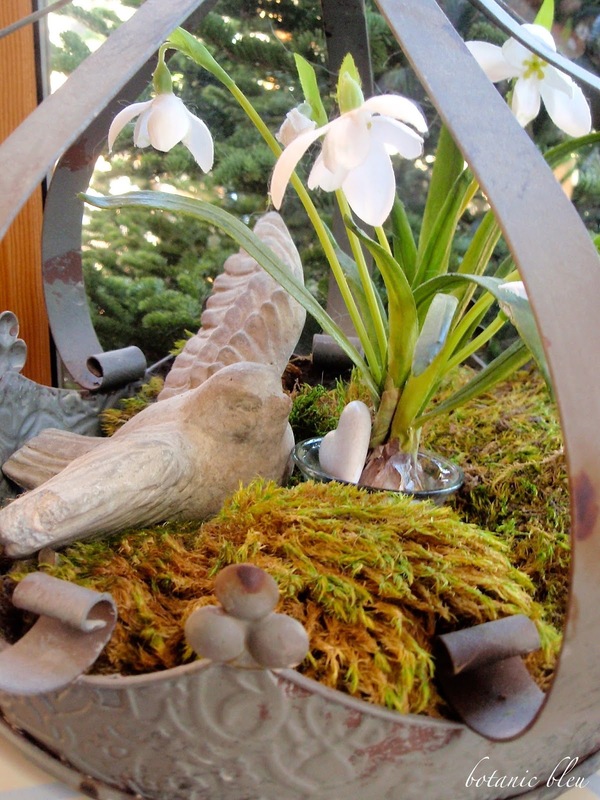 Add a single small faux plant like the snowdrop. Finish by adding a small figure such as the concrete bird whose gray color goes well with the gray crown. A small reclining deer would be a good Christmas figure to use instead of a bird. I like the snowdrop because it is white, but another possible small faux plant to use is a grape hyacinth, also called a muscari. Both snowdrops and grape hyacinths bloom in the midst of winter which means the little moss container would look good all the way into spring. 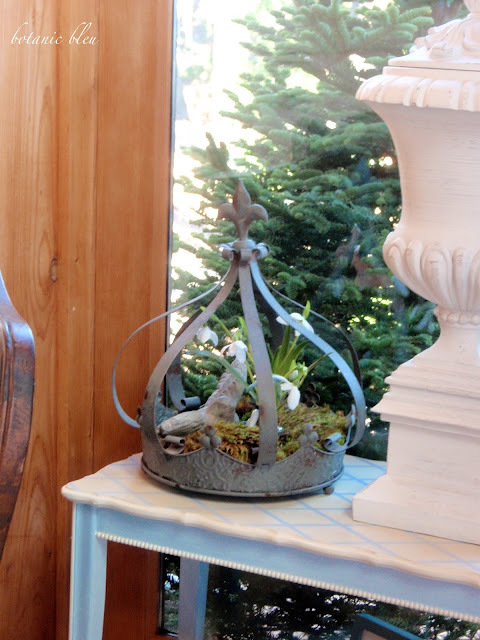 Another container that has a French Country design is a pedestal urn. Nothing is easier to use to fill a container than pine cones. 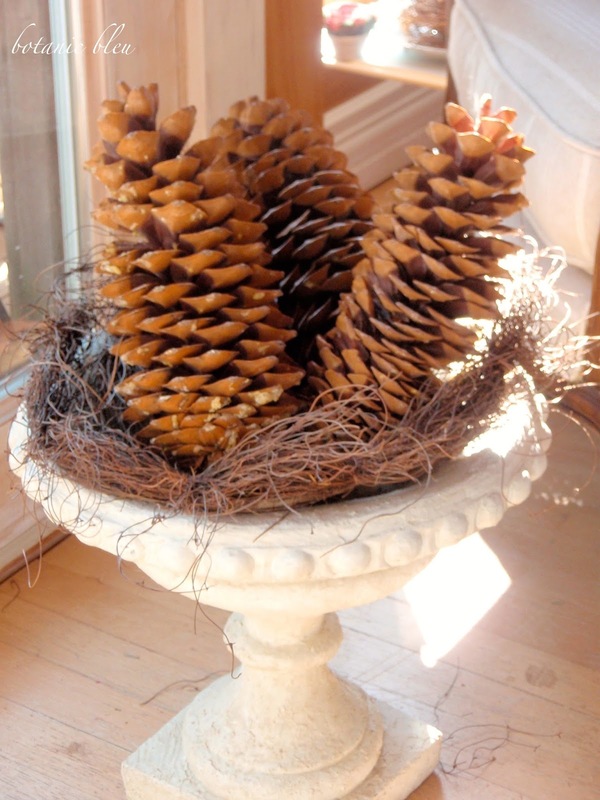 Oversized Sugar pine cones are perfect for large containers. There are only four pine cones in this large urn. 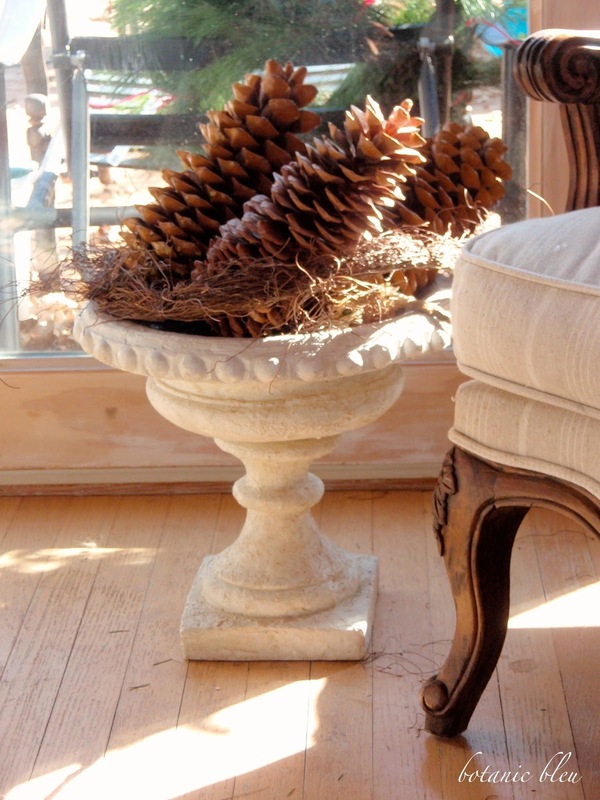 The dried vines shaped in a loose wild circle provide a transition from the urn to the pine cones. The pine cones in the white urn go well with the French bergère chair that has fruitwood finished carved curvy legs and white and beige striped linen upholstery. The best part is no watering needed. Do you see repeating themes in my decor? I love birds, and I love boxwood. Oh, and I love bleu. Another easy and fast Christmas decoration is a shallow white bowl filled with small preserved boxwood balls, gold painted hand-carved wooden birds, and a single faux gold bead and leaves spray. It's another arrangement that does not require watering. Begin with placing three preserved boxwood balls in a shallow bowl. Place one floral spray with the boxwood balls, and pull the beaded stems outward so they rise above the boxwood in several directions. 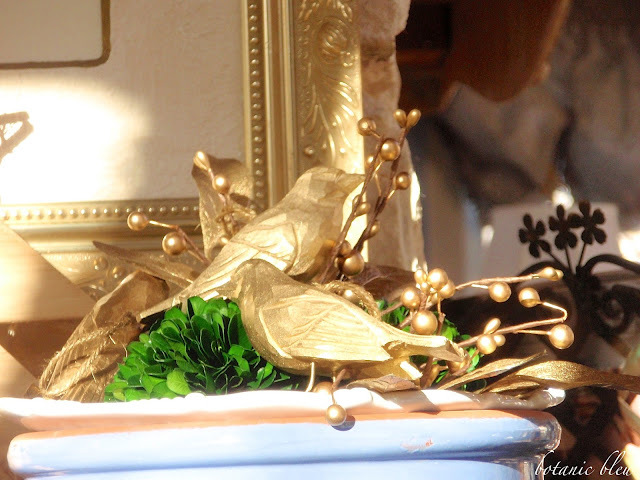 Finish by placing two to three gold birds atop and around the boxwood. 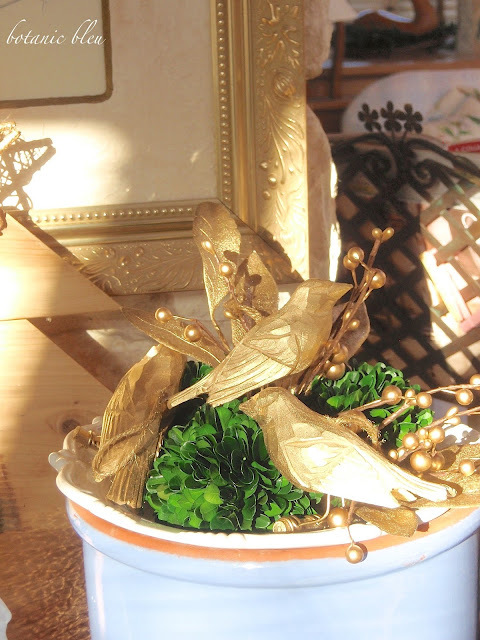 This arrangement took the most time because the birds had to be spray painted gold using Rust-Oleum's metallic gold spray paint. Adding a wreath to an existing wooden carved horse is just one way to dress up the horse. Another fast, easy way to dress the horse for the holidays is to tie a large braided cord with metallic threads as a rein around the horse's neck. While red and green are traditional Christmas colors, choose to use a braid in a color that coordinates with your existing color scheme. 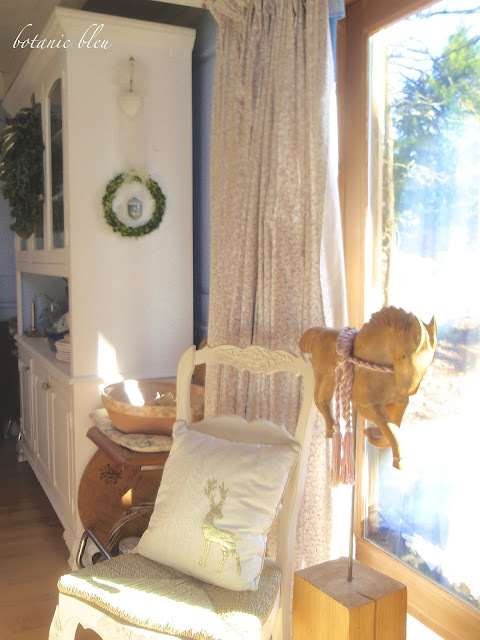 The pale mauve braided cord coordinates with the curtains in the living room. 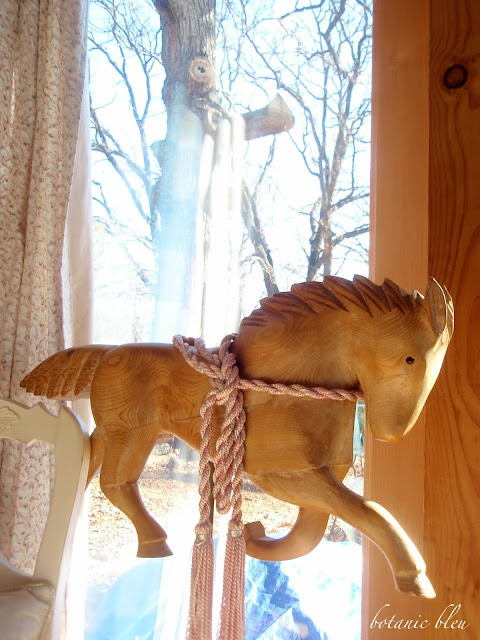 A large satin or wired ribbon could also serve as a holiday rein for a wooden horse. 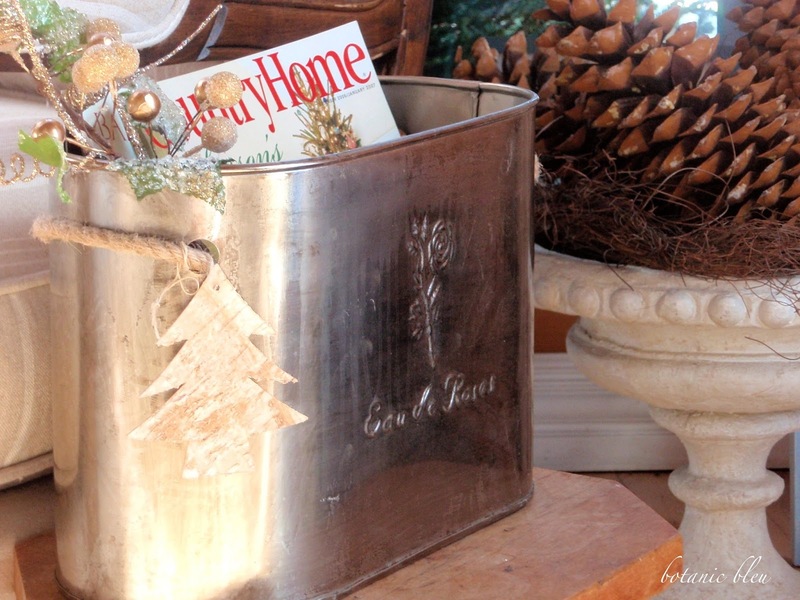 This is a super fast and super easy way to add Christmas decor to an existing item. 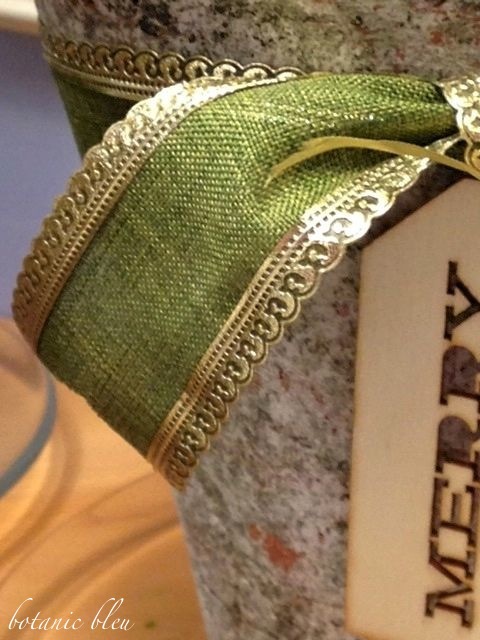 First, tie a Christmas gift tag like this birch tree tag to the handle of the magazine box. Next, add a sparkly gold beaded spray to one end of the magazine box near the gift tag. Bend two or three of the leaves or twigs over the edge of the box to stabilize the spray, and place the spray inside the box. Finally, add December issues of your favorite magazines so they are visible with other months' issues behind the December ones. 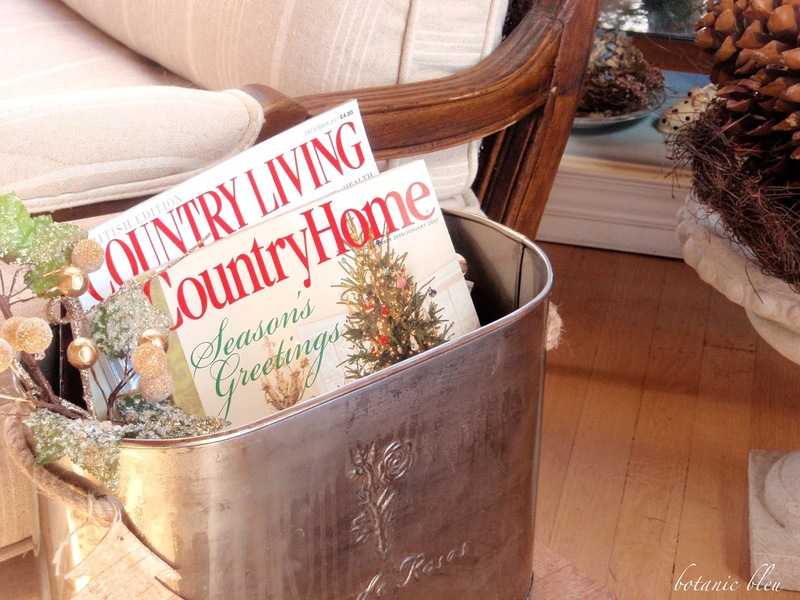 Seasonal catalogs also have beautiful Christmas covers that are fun to display in a magazine box. Plus, the box keeps the catalogs handy for making wish lists. With just a few easy decorations, the living room is almost ready for Christmas leaving lots of time for shopping, watching Christmas movies, listening to Christmas carols, baking Christmas cookies, and spending time with family and friends. 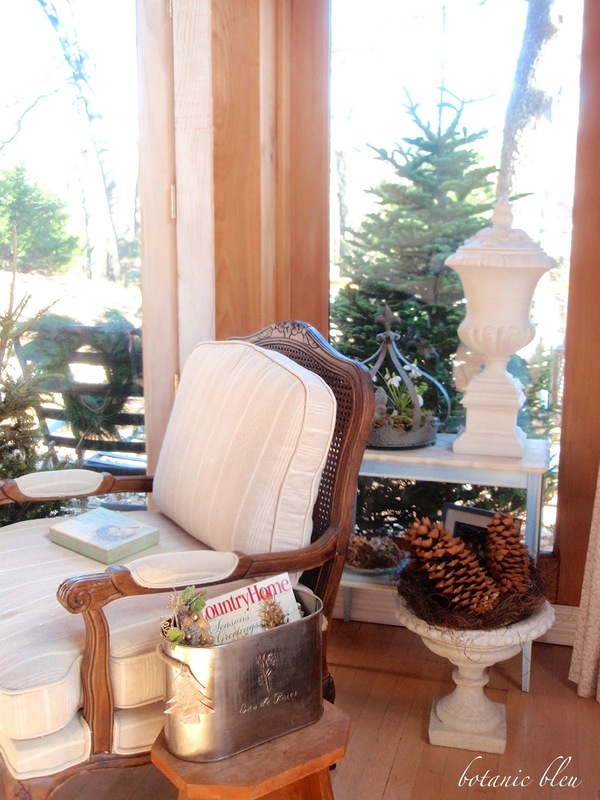 Here is a peek at how the living room looks with three of the easy Christmas decor arrangements. There are a few more decorations to add to the living room, including dressing the fireplace mantel with boxwood wreaths. Stop by in a couple of days to see the entire living room decorated for Christmas. I have a wee metal crown that would indeed look SO cute on a plant. I"ll need to find one. Merry and bright! Judith I can tell you have a green thumb! I love how you incorporate natural elements in all your decorating! It is so charming. I've got a crush on that spectacular crown and your magazine box is so dreamy. Always pretty at your house ... I love that magazine box! You have great ideas! I agree with the others that you magazine holder is beautiful. 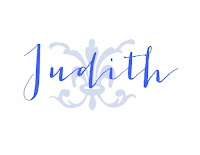 Judith I really have enjoyed this tour through your beautiful rooms and your décor suggestions. This year our home is filled with many tiny trees, European cypress and Norfolk Island pine but not a large tree. Your tall urn with the lemon cypress is gorgeous and your horse divine. Enjoy the magic of the season. Great ideas! Love the crown! They are all beautiful but that crown stole my heart! That crown is adorable. I love it.